The first manatees of the season have been spotted along the coast of South Carolina, which means the S.C. Department of Natural Resources is again reminding boaters to be on the lookout to avoid collisions with the endangered animals. Feeding and watering manatees is illegal and encourages them to spend time at docks and marinas, making them susceptible to boat strike which is one of the main causes of mortality. Enforcement efforts to prevent the feeding/watering of manatees will be enhanced in South Carolina. With an estimated population of only 3,000 animals in U.S. waters, manatees, also known as sea cows, are protected as an endangered species under federal and South Carolina law. Dangers to the species include boat strikes, entanglement in fishing gear and harmful algal blooms known as red tides. 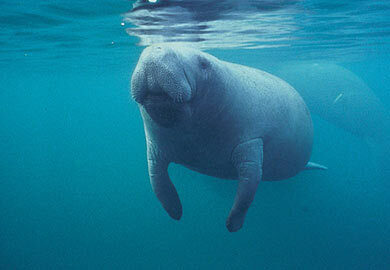 Although Florida manatees are present throughout the year in Florida, they are migratory in South Carolina. Manatees begin their slow migration up the South Carolina coast each spring when water temperatures rise into the upper 60s. They can be found in tidal rivers, estuaries and near-shore marine waters throughout Georgia and the Carolinas throughout the summer months. Manatees return to Florida in September and October as the water temperature cools. Adult manatees are about 10 feet long and weigh up to one ton. Their skin varies from gray to brown, and their bodies are rounded with two pectoral flippers and a wide, flat tail. Subsisting on marsh grass and other aquatic plants, the animals are gentle and pose no threat to humans. It is illegal to hunt, play with or harass manatees, this includes touching, watering or attempting to feed. Manatees have a slow reproductive rate. Females are not sexually mature until about 5 years old, and males mature at about 9 years of age. On average, an adult female gives birth to one calf every two to five years, and twins are rare. The gestation period is about a year. Mothers nurse their young for one to two years, so a calf may remain dependent on its mother during that time. Manatee calves are about 4 feet long at birth and about 60 pounds. The number of manatees along South Carolina’s coastline each year is unknown because the turbid, murky waters near the coast make surveys difficult. South Carolina residents can help biologists learn more about the movements and habitat use of manatees by reporting any sightings and taking photographs. If a boat accidentally collides with a manatee, the S.C. Department of Natural Resources (DNR) asks that the boater stand-by and immediately contact the U.S. Coast Guard on VHF Channel 16 or DNR at (800) 922-5431. Doing so provides biologists the best chance to help the animal and gather valuable scientific data. Report a healthy, live manatee online. Please note the date, time, location and number of manatees seen, as well as the coordinates, if possible. Photographs of scars on their backs and tails are especially useful because they can often be used to identify previously known manatees. Report an injured or dead manatee by calling the DNR Hotline at 1-800-922-5431. Find out more about manatees in South Carolina. * Look around for manatees before cranking your boat’s motor. from boats in these areas. * Please heed "slow speed," "no wake" and manatee warning signs, especially around docks. * Wear polarized sunglasses to reduce glare, making it easier to spot manatees below the surface. * Watch for large swirls in the water called footprints that may be caused by manatees diving away from the boat. * Dock owners should never feed manatees or give them fresh water. This could teach the animals to approach docks, putting them at greater risk of a boat strike, and it is illegal. * Never pursue, harass or play with manatees. It is bad for the manatees and is illegal.